In America, seasonal change is ushered in by Macy’s and its productions, from the holiday season with the Thanksgiving Day Parade to summer with fireworks for America’s birthday. When it comes to welcoming spring, the department store puts on its annual Flower Show, a longstanding tradition that began 65 year ago and is now marking its 42nd year at the company’s Herald Square location. This year’s show, America the Beautiful, celebrates the wonders of the nation’s natural world at five stores around the country (NYC, Philadelphia, Chicago, Minneapolis, San Francisco). For New Yorkers who visit the show, it’s a chance to step out of the hustle and bustle and immerse themselves in gardens representing various regions of the United States. 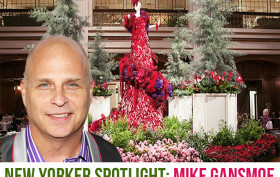 The executive producer behind the show is Mike Gansmoe, who is responsible for overseeing everything from conception to putting that last flower in place during overnight setups. 6sqft recently spoke with Mike to find out what’s blooming at this year’s show.